Do you ever wonder why you are here? "Why am I here ?" can be investigated via psychology and physics. "Why am I here ?" can be investigated by philosophy. From a psychological angle, we're moved by desires and fears  two sides of the same coin. You can thank some combination of desires and fears for being here today. From a standpoint of physics, you could say: "I'm here because I'm not somewhere else. I'm a material body, and material can't be in two places at once. Are you sure?? We run into great contradictions when we get down to the subatomic level. I've been reading Science as a Spiritual Practice by Imants Baruss, a Psychology professor at Kings University College in London, Ontario and a Franklin Merrell-Wolff fan. His first chapter is an attack on materialism, which he says still grips academic science despite decades of contrary data. One of the examples he gives is the double-slit experiment in particle physics. It's been years since I read The Dancing Wu Li Masters, so I did some Internet searching and found Richard Feynman's description of the double-slit experiment, which is easy for a layman to understand. The general setup is that there's a barrier with two slits that can be opened or closed independently, with a detection screen behind the barrier. 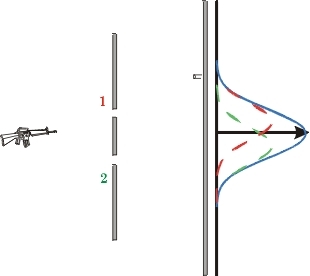 In the particle test, bullets are fired from a machine gun, and the distribution of where the bullets hit the screen is observed when the first slit is open and the other closed, then again with the first slit closed and the other open. Next the test is repeated with both slits open. The distribution of hits when the first slit only was open is represented by the red graph in the accompanying chart, while the distribution of hits when the second slit only was open is represented by the green graph. The distribution of hits when both slits were open turns out to be the "sum" of the two patterns when individual slits were open. These graphs represent the expectation behavior when any types of particles are sprayed at the barrier. 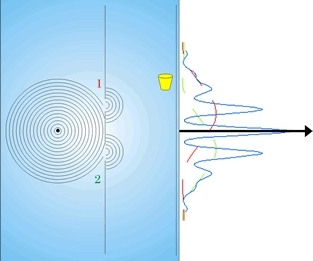 In the wave test, the barrier and screen are positioned in a container filled with water, such as an aquarium. There's a device that creates waves on the side of the barrier away from the detection screen. The distribution of where the waves contact the screen is observed when the slits are open one at a time, and then when both slits are open. With the wave test, there are spots on the screen that were hit when individual slits open that don't get hit when both slits are open  unlike with particles. This phenomenon is referred to as an "interference pattern." Notice that the blue graph, the distribution when both slits were open, has multiple peaks unlike the bell-shaped curve of the particle test. Now that we've seen the expected results with particles and waves at the everyday level of our sense experience, we move down to the subatomic level. Here the double slit test uses an electron gun in a vacuum tube (like a TV or cathode ray tube computer display). Electrons are particles, having a well-defined mass, an electrical charge, and so on. The inside end of the vacuum tube is coated with a phosphor, producing a small burst of light when hit by an electron. With the upper or lower slit in the barrier open by itself, an observer watching the TV sees a bar of light across the screen either above or below the center, depending on which slit is open. With both slits open, we expect to see the "sum" of those two patterns  i.e., two bars of light, one above and one below the center of the screen. But what we actually see with both slits open is alternating rows of light and darkness  like the interference pattern of the wave test above. The particles are behaving like waves! Could the electrons may be interfering with each other after they pass through the barrier when both slits are open. In order to check this, we slow down the firing rate so that only one electron is in the system at a time. After a large number of electrons have been fired, we see that the distribution is still a wave pattern! but it gets worse! What if we wait until after the electron has passed through the barrier before we make a decision to turn on the detector? Baruss tells us that if we decide to turn it on, we find that the electrons have acted like particles; but if we decide not to turn it on, we find that the electrons have acted like waves. The electrons appear to know which decision we're going to make before we make it, showing what appears to be a backward causation in time! From a presentation, "The Simplicity of Being," made at the TAT Foundation's 2007 spring conference.